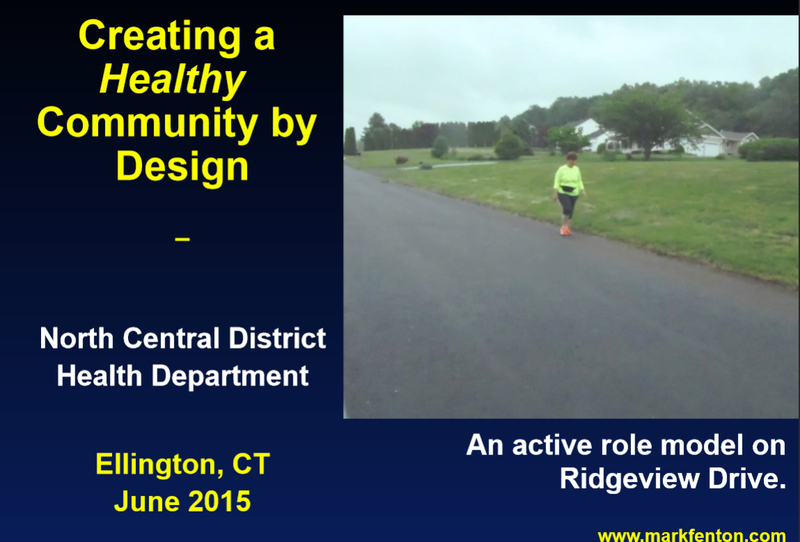 I attended a workshop on June 9, 2015 in Ellington on Building Healthy Communities. It was an excellent presentation. Following is an overview and a link to the slide presentation. The workshop was sponsored by the North Central District Health Department (NCDHD), which also includes Vernon. Their Vision is healthy people in healthy communities. Their Mission is to prevent disease, injury and disability by promoting and protecting the health and well-being of the public and our environment. Part of their advocacy is exercise programs, nutrition education and childhood obesity prevention. It was hosted by the Ellington Conservation Commission and the Ellington Planning Department (Lisa Houlihan) and attended by about 25 people including selectmen, members of town boards and commissions, as well as interested residents. Ellington is working on a Route 83 Corridor Planning Study. The town is having a conversation on what their gateway highway should look like in the future and how to control development as they are not happy with how it has been evolving. Planimetrics, who wrote Vernon's Plan of Conservation and Development, is doing this study. 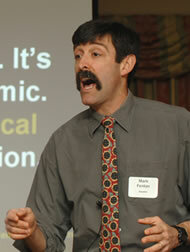 The presentation was by MARK FENTON (MarkFenton.com), a Walkable Communities expert. NCDHD is sponsoring Fenton's programs in a number of area towns. With audience input we agreed that most of us grew up as ‘free range kids' - sent out to play and called home for dinner. This is no longer the case in most instances for a number of reasons, including community planning. From discussing health issues Fenton segued into community planning and simple steps that can improve connectivity and safety. The 90 minute presentation may have been over simplified, but the purpose was to encourage dialog and suggest some reasonable ideas and programs for improvements. Fenton did his homework by spending the day touring the area with local experts in different areas. This included some time in Vernon as he specifically noted Vernon's excellent trail system and the Rail Trail's connection to neighborhoods. He also noted the possibilities for Rockville's shopping area as he advocates for walkable areas rather than back from the road, unconnected, big box stores. He feels that when it is convenient to bike and walk people will make healthier choices. Bad examples in town were developments that could have connected to either trails or other developments rather than only to arterial streets. Fenton's research shows that Healthy Communities attract families, increase property values and attract businesses who's employees increasingly want to get exercise at lunch. Websites such as WalkScore.com are now used by those wanting to locate in friendly communities and by Realtors to attract them. Other online tools are also available for analyzing your community. Ideas were introduced for improving traffic flow in downtown areas for pedestrian and bike traffic, as well as suggestions for regulation changes to consider. Often small, inexpensive changes will make a big difference. For example, when developers plan a new project they are required to do a traffic study. It would add little to include public transit, biking and walking in the study and makes them part of the conversation. This is the Complete Streets concept. In summing up he returned to our health problems pointing out that our children's life expectancy is two years lower than ours. Fenton's presentation included much more in the way of statistics, supporting studies and examples. See the slides he used for more. He recommends that towns convene a working group of about ten members from different areas to begin the dialog. Each of the working group members would have connections to different parts of the community they could draw from and communicate with. Vernon's POCD (Page 55) has a recommendation to Promote Community Spirit by working with community groups and engaging a wider array of residents to implement the POCD. This part of the plan has not been implemented, but a Healthy Communities dialog could be a starting place.